Heraldry: "I'm the Earl of Huntingdon (and You're Not)!" Please feel free to click on the image to go to a larger version, so that you can take it all in more effectively than in this comparatively small version here. Though it has clearly suffered some damage over the years, it remains a most impressive piece of heraldic decoration. It is, of course, the arms of Hastings, Earls of Huntingdon (or Huntington). The seventh creation of this Earldom, the title was given to George Hastings by Henry VIII in 1529. The title continues, the current Earl, William Edward Robin Hood Hastings-Bass, being the 17th. 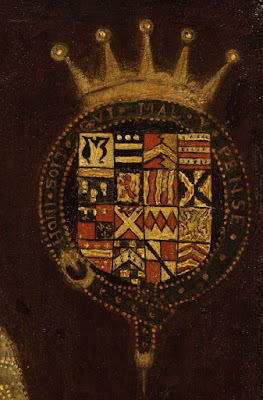 The pronomial arms, in the first quarter (the upper left of the shield as you look at it, are Argent a maunch sable. The crest (atop the helm) is A bull's head erased sable armed and gorged with a ducal coronet or. The supporters on either side of the shield are a fairly unusual monster, Two man-tigers guardant or. A man-tiger (or sometimes, man-lion) is basically a lion with a bearded man's face. I've not had the time to look up the identification for each of the quarters here (none of the peerages I have give more than the Hastings arms, and there's only so much time in the day; I can only let the yard grow wild for a short while before having to get back out there and weed whack back Nature in all its fecundity), but if you look closely you can quickly identify the Royal Arms of England (Quarterly France and England) with a label and the well-known arms of the Spencers. 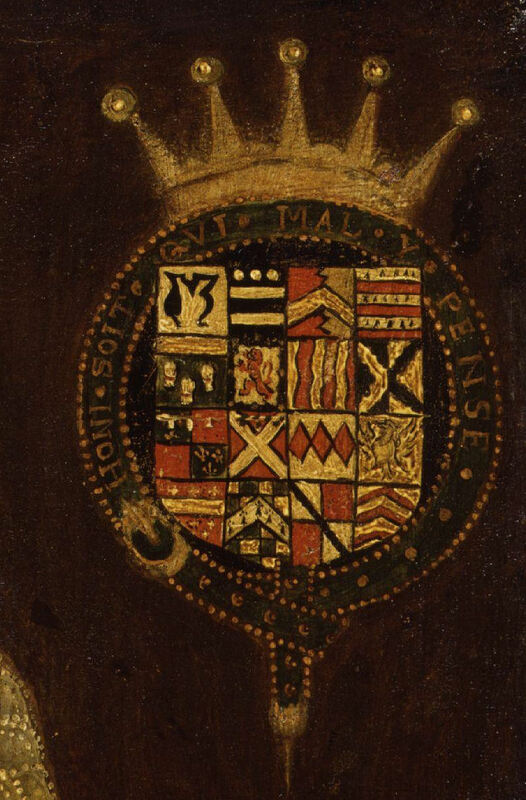 For comparison, here we have the arms from a portrait of Henry Hastings (b. 1536), 3rd Earl of Huntingdon (1560-1595). As you can see, the 3rd Earl's arms are painted with sixteen quarters, while our carving above only has twelve, and in a slightly different order. Still, it's nice to be able to see the colors without having to look everything up. All in all, what a great piece of heraldic art, a wonderful display, and, of course, a method of saying to everyone who sees it, "I'm the Earl of Huntingdon (and you're not)!"